Editor’s Note: Join Beyond Type 1 + Connected In Motion at the Northeastern Slipstream in Maine May 31 – June 2! Register here. Shuttle available from Portland, Maine airport. Check out all Slipstream offerings here. Diabetes camp for adults. Yep. It’s a thing. Whether you grew up going to camp or you’ve never slept in a cabin, a Slipstream weekend might be exactly what you’re missing. It’s great to go to the endocrinologist, but what about your mental health? It’s nice to connect with other people with Type 1 online, but what about real, in-person connection? But if you’ve never been to a Slipstream before, you probably have some questions. We’re answering the most commonly asked Qs about our weekend retreats for adults living with Type 1 diabetes to put your mind at ease! What is a “Slipstream” anyway? Slipstreams are weekend retreats for adults with Type 1 diabetes brought to you by Beyond Type 1 + our partners at Connected In Motion. The word “slipstream” comes from a cycling term — it’s the area of reduced air pressure and forward suction immediately behind a rapidly moving vehicle or person. Here’s the philosophy: It’s easier to travel in the Slipstream. When people with Type 1 diabetes get together, we can share the challenge of moving ourselves forward. Learn from one another. Take a break and let others lead. Share our experiences. Generate momentum. We like to think that spending a weekend with the Type 1 diabetes community is like hopping into the Slipstream. An opportunity to recharge, learn, follow and lead, all at your own pace. Slipstream weekends offer a mix of educational and peer support sessions, fun outdoor activities, and casual opportunities to hang out with new friends. Do people go alone if they don’t know anyone else with Type 1? Absolutely. In fact, MOST Slipstream attendees show up knowing no one else there. We always have a mix of first timers and returning folks and take pride in how welcoming these weekends are. Slipstreams include time for icebreakers, storytelling, and casual downtime. If there’s one nice thing about living with Type 1 diabetes, it’s that you have a substantial thing in common with other people who live with it, too. What ages attend? I’m worried I’m too old/young. Slipstream weekends are open to adults 18+ living with Type 1 diabetes. There’s always a range! 20-somethings, 30-somethings, 40-somethings, 50-somethings, 60-somethings and sometimes 70-somethings have come out. The crowd skews on the younger end of that, but something we love about Slipstreams is the opportunity to learn from adults of all ages and compare experience. If you’re a veteran, we want your know-how and stories in attendance!! What type of physical activities are we talking? Depending on the camp location, you might have the opportunity to: conquer the ropes course, swim, canoe, kayak, waterski, hike, trail run, do yoga, compete in a cooking challenge, or learn to fly fish. That sounds … intense. Do I have to participate? If the high ropes courses aren’t really your thing, that’s totally cool! All of the activities and sessions at a Slipstream are 100% optional. You get to build your own schedule based on the sessions and activities offered. So if after yoga and a mental health session you’re looking to lounge and read a book, that’s great! Slipstream is what you make it. Another reason camp is better as an adult! We believe in eating healthy and ensure that our attendees are well-fed throughout the weekend. At a typical Slipstream you might find eggs and French Toast for breakfast, grilled chicken wraps and a salad bar for lunch, with flank steak and veggies for dinner. Juice and water are provided with every meal, but it wouldn’t be out of place to bring a few adult beverages for yourself. We do our best to accommodate special dietary requests, and our team works closely with the venue to ensure they are aware of any food allergies or special diets in the group. Most of the venues we use are nut-free. The full price for registration is $375, which covers accommodations, food, and programming from Friday afternoon through Sunday afternoon. Early bird registration will save you $50. We work with sponsors to keep registration costs low, and understand that this can be a limiting factor. If the cost of a registration is prohibitive for you, please reach out to us at hello@beyondtype1.org – scholarships may be available! Do you have a location in [your state/country/continent here]? In 2019, Beyond Type 1 + Connected In Motion are excited to offer Slipstream weekends in Maine, Colorado, Southern California, and Ontario. Colorado is new this year, and we’re always looking to expand. Drop us a line and tell us where we should come next. Hope to see you out there this summer! Register for our Maine Slipstream here. Learn more about Slipstreams + the full summer 2019 schedule here. 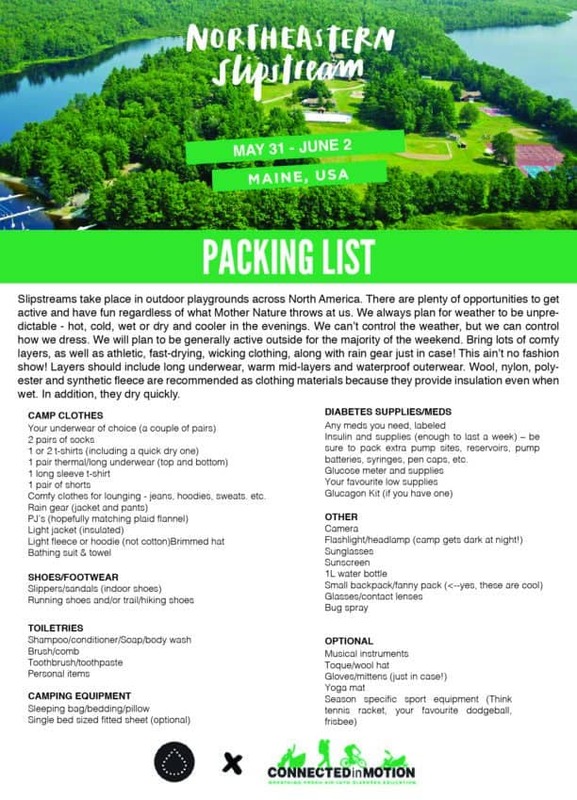 Find your packing list here. The Beyond Type 1 2015 Gift Guide!